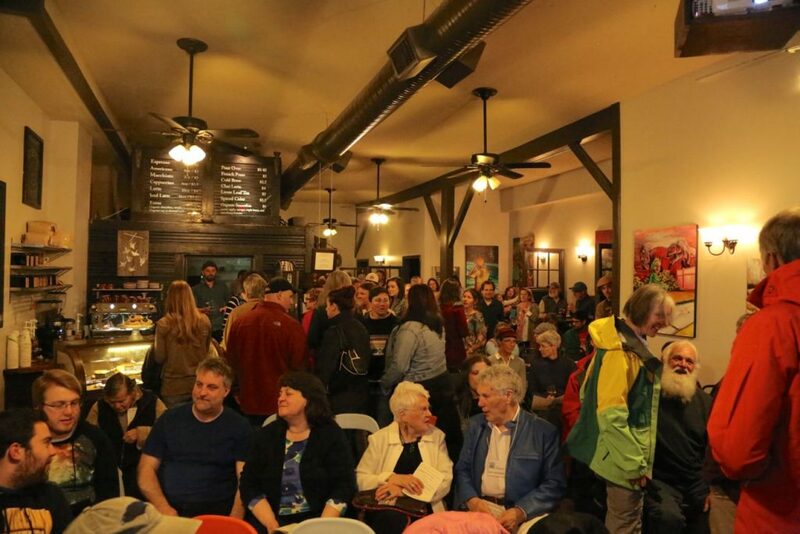 The cool and rainy Saturday evening of April 25, 2015 found friends and neighbors from Tucker County welcoming visitors from greater West Virginia, Maryland and D.C. to the inaugural Plum Tuckered Film Festival. Cade and Carrie Archuleta of TipTop turned their cozy cafe into a bustling movie theater. Ten of the 26 short films shown were represented by attending filmmakers, each receiving a swag bag put together by the partnering sponsors (Blackwater Outdoor Adventures, Verglas Media, TipTop and ArtSpring). The staff of TipTop worked hard making coffee and drinks and serving up Sirianni’s pizza by the slice. The lights went down and the festival kicked off with Between Poles, a film by Mark Anderson shot at White Grass Ski Touring Center. Suddenly the audience was on a free-heel ski adventure through the woods. Next up was an animated film from Hungary, The Coyote and the Rock, and before our eyes an ancient Sioux Indian tale came to life. These two films serve to illustrate the wide variety of movies screened. Over half of the films were created by or featured West Virginians, many from Tucker County; however films from all over the country and world were shown. In its first year, Plum Tuckered turned international. Todd Romero’s Tucker County Snow Daze was an audience favorite as we relived the endless snowy weather of February that kept schools closed and the slopes a powdery paradise. Isabelle Judy, this year’s youngest filmmaker, got the audience cheering with her film Timberline Ski Club. Joel Wolpert screened an energetic promotional piece about the Tucker Community Foundation. Brad Carroll and Jennifer Walker represented Compassion Connects, a film that featured their time in Nepal working in small, rural community acupuncture clinics. Warning: Take only as Directed – a musical film about the tragic consequences of prescription drug use in teens – was represented by the film’s music composer, Diana Villamor. Renowned American dancer and choreographer Dan Wagoner was in the crowd as Dan’s House screened. Three dancers performed some of his particularly playful choreography on the property of his 18-century home in Romney, West Virginia. One of the festival’s organizers, Victoria Weeks screened her film Our Pale Blue Dot, a short documentary narrated by William Peterson. The film explores our view of Earth from space and the birth of this beautifully vital perspective of our only home. Victoria’s film was followed by Leka, one of the evening’s five award winners, a music video about children making spectacular use of a playground in Stockholm, Sweden. That brings us to one of the night’s coolest moments, when filmmaker Andrew Nelson won the Best Short Local Adventure category for his film Early Bird. The fun, playful vaudeville-style film is perfectly accompanied by the musical talents of Aurora Celtic and tells the story of two fishermen, one always one step ahead of the other. The complete list of awards is as follows: Best Short Local Adventure – The Early Bird by Andrew Nelson. Best Short Animated Film – re÷belief by Raymond McCarthy Bergeron, an amazing feat of creativity in the form of 3D printed objects; a zoetropic short-film that asks if recalling memories can break a cycle. Best Music Video award went to Leka by Goblin Mikkanen. Best Short Documentary was awarded to Not Anymore: A Story of Revolution by Mathew Van Dyke. The film revealed a heartbreaking look at the devastating consequences to people’s life and way of life as the Syrian civil war rages on. The evening concluded with a French film, The Getaway, winner for best Short Narrative. Directed by Cedric Messemanne The Getaway follows a pensive young man on a romantic walk in the forest with his girlfriend. On the way, catching a stray dog crossing the road in his rear view mirror, he vividly recalls a dark day in his childhood when his father left his dog behind. Award trophies, unofficially dubbed “The Flagtree”, were artfully created by Luke Fleischman. The film festival organizers Patrick McCann, Victoria Weeks, Cade Archuleta and Audrey Stefenson watched 69 entries to choose the 26 films screened. Four jurors from outside the community with extensive experience in the film and media industry joined the team to pick an awardee in each category. There was no charge at the door, though attendees had the opportunity to donate to Cottrill’s Opera House restoration efforts. The five winners will be screened again during ArtSpring in the Opera House. For more information and to learn about the films, please visit PlumTuckeredFilmFestival.org.